Resolving the heterogeneous chemistry that occurs at the surface of atmospheric aerosol particles is pivotal to understanding the composition and behaviour of the atmosphere. A well-studied example is the chemistry which produces the reactive free radicals that lead to the destruction of the ozone layer in the polar-regions. Heterogeneous oxidative aging can also dramatically alter the physical and chemical properties of the aerosol particles themselves, significantly affecting visibility, human health and climate change. As a result, much research has focussed on studying the reactions which occur between particles and the surrounding gas phase. Conventionally, heterogeneous chemistry is investigated by performing ensemble measurements on a macroscopic aerosol sample under controlled environmental conditions. The fundamental problem with such studies is that the results are necessarily averaged over the entire ensemble and fail to resolve the variability in size, composition, mixing state and morphology between individual particles in the ensemble. Such techniques can only ever deliver averaged estimates of the properties being investigated. The Biral AOT-100 (Aerosol Optical Tweezers) provides a unique platform to continuously expose an individual droplet-of-interest to a reactive gas phase and directly study the resulting heterogeneous chemistry. Individual aerosol droplets can be isolated in a tightly confined optical trap and suspended in a highly controlled environment for periods of time extending from seconds to days, if necessary. Changes in chemical composition are monitored using cavity enhanced Raman spectroscopy, which also provides a signature of size and refractive index with a precision far beyond what is achievable with other techniques. Measurements are made with a temporal resolution of 1s or better, and the in-situ analysis gives real-time information on the progress of a reaction. 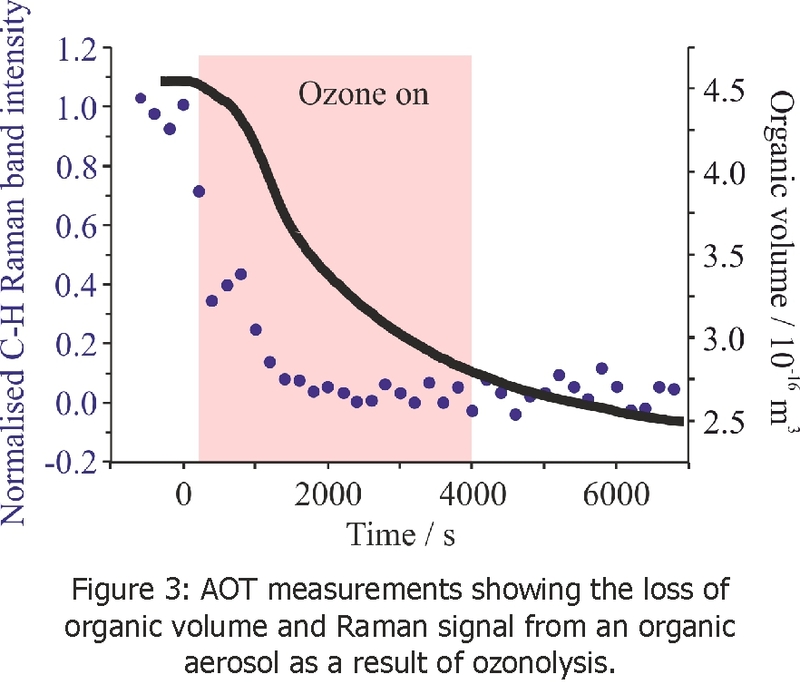 Figure 2 presents measurements of a typical heterogeneous reaction, in this case for an individual aqueous organic droplet exposed to ozone, recorded using the AOT. 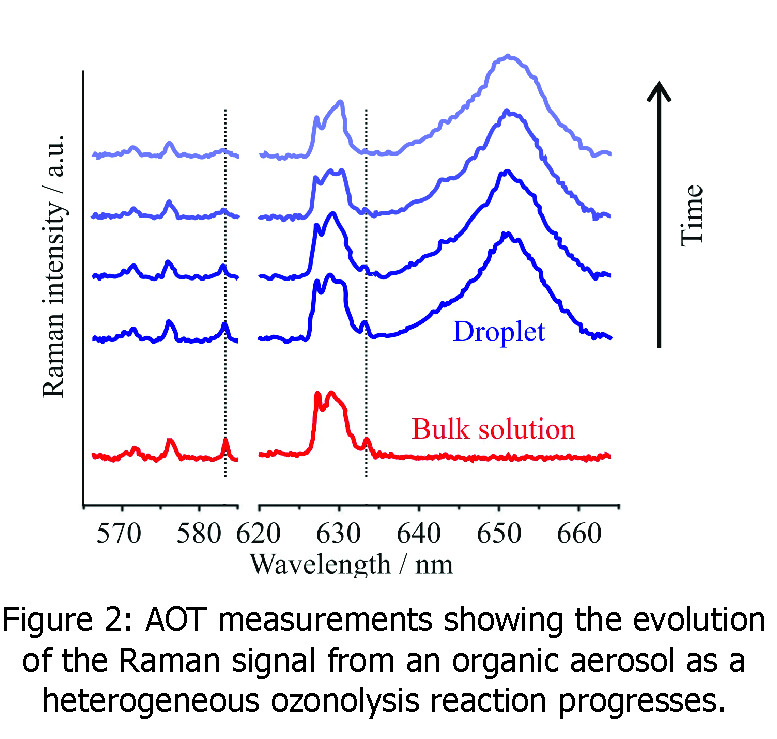 The Raman signal centred at ~ 627 nm is indicative of the organic component of the aerosol and the reduction in intensity over the course of the experiment is a result of the oxidation of the organic species. The trend is shown more clearly in Figure 3, which also demonstrates how highly precise radius measurements can be used to calculate the reduction in droplet volume as the more volatile products evaporate from the surface. Observing the evolving chemical and physical properties of a single droplet is not possible with any other technique. Additionally, the relative humidity can be adjusted over the full range to mimic atmospheric conditions. This ideally lends the AOT-100 to combining heterogeneous reactions with hygroscopicity or vapour pressure measurements to analyse the change in the physical properties of a droplet-of-interest as a result of the heterogeneous chemistry.